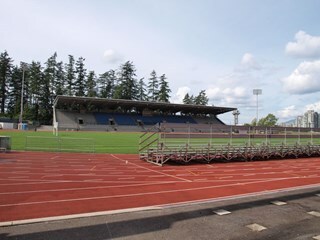 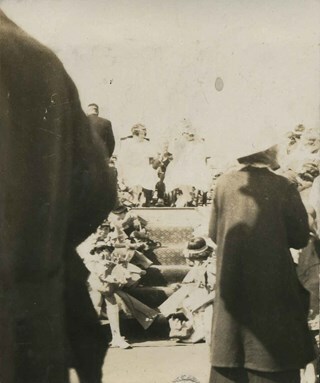 Photograph of Burnaby's first May day, with the stage where the first May Queen, Ruth Bearn is sitting. 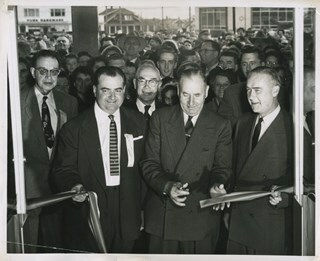 None of the other people standing in front of nor on the stage are identified. 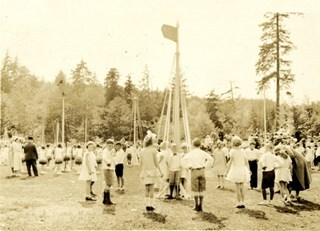 Photograph of May Day Maypole dancing at Central Park during Burnaby's first May Day celebrations. 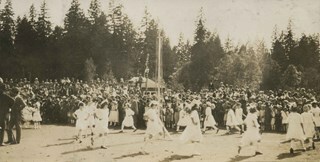 A number of girls in white dresses are dancing around the pole while a large crowd looks on. 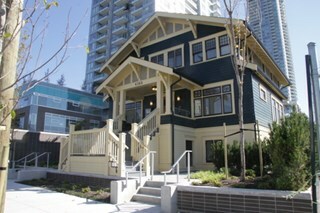 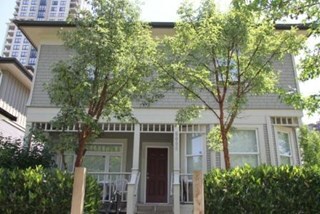 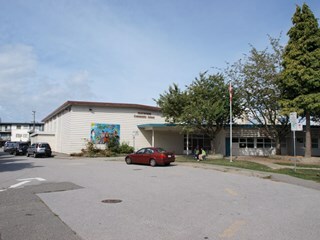 Photograph of the exterior of Kingsway West School (originally named West Burnaby School). 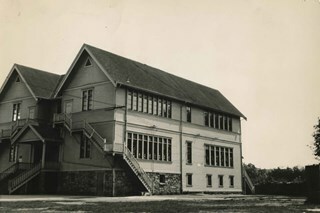 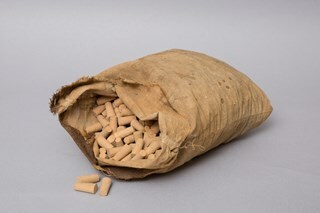 In 1952 the school ceased operations. 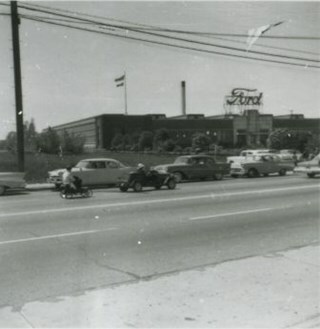 Simpson Sears was later built on this site. 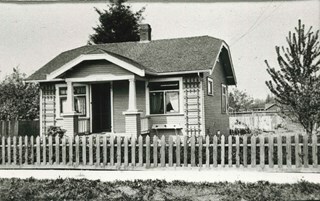 Stamp on back reads, "Universal Appraisal Company Limited"
Photograph of a girls' tennis team at Kingsway West School (originally named West Burnaby School). 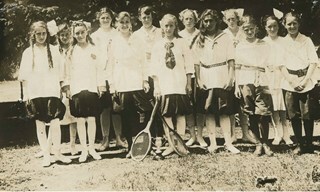 Thirteen girls are standing outside; two of them are holding tennis racquets. 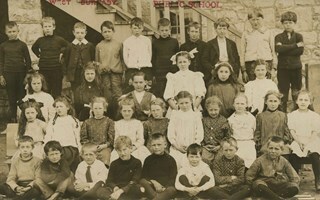 Photographic postcard of a West Burnaby School (later renamed Kingsway West School) class sitting and standing outside. 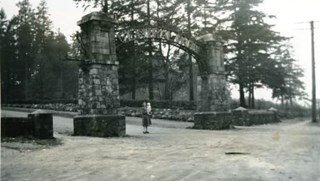 The students are unidentified. 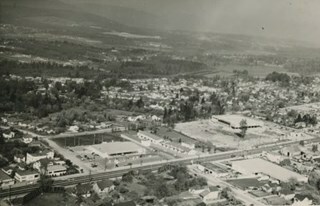 Stamped across the top of the photograph, "West Burnaby / Public School"
Aerial photograph of the Old Orchard Shopping Centre on Kingsway. 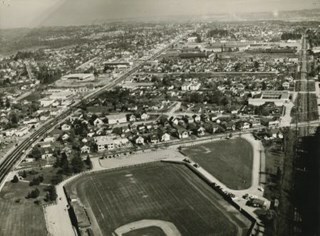 Aerial photograph of Kingsway and Central Park. 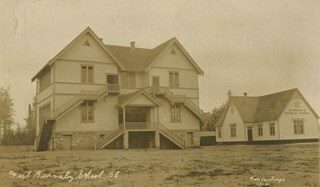 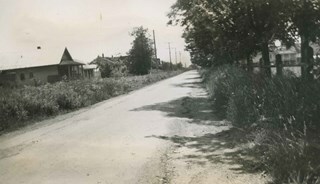 Photographic postcard of West Burnaby School (later renamed Kingsway West School). 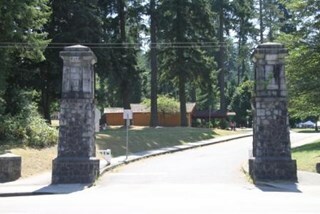 The sign on building on the right reads, "Gymnasium & Technical School." 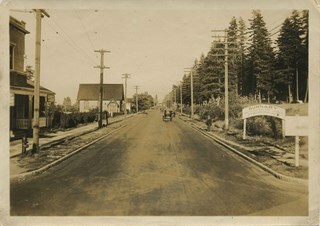 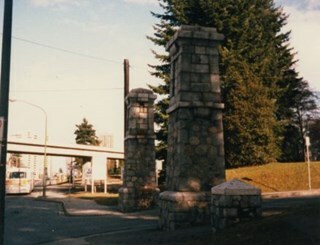 Photographer's title reads: "West Burnaby School, BC / Barrowclough Cards"
Photograph of the back of the Central Park Arch at Patterson Avenue and Kingsway. 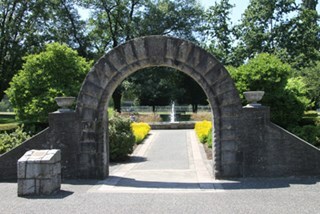 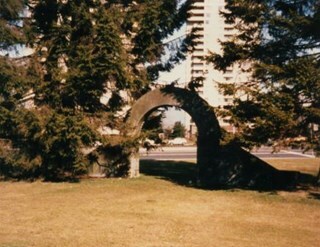 Photograph of the front of the Central Park Arch at Patterson Avenue and Kingsway. 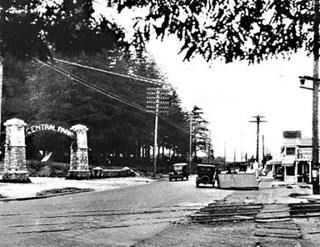 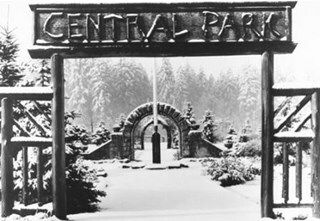 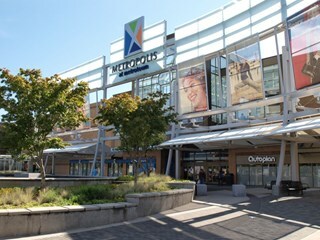 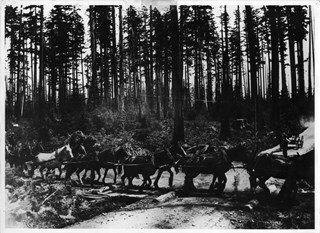 Photograph of the Central Park entrance on Kingsway. 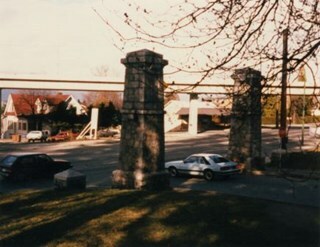 A car can be seen exiting the park, and the tracks of the Skytrain Expo line are in the background. 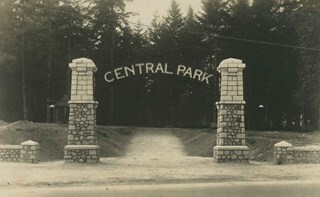 Photograph of the Central Park entrance on Kingsway. 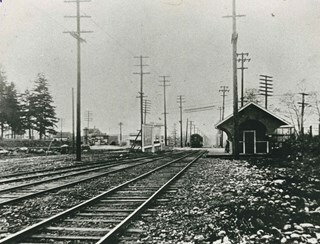 The tracks of the Skytrain Expo line can be seen in the background. 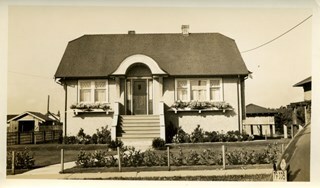 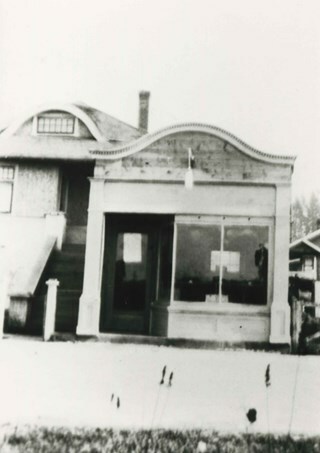 Photograph of Wilson Forster's plumbing and electrical business and the Forster family home at 2849 McKay Avenue (later renumbered 6208 McKay Avenue). 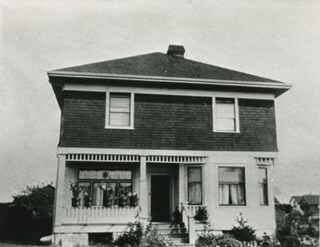 Photograph of Wilson Forster's plumbing and electrical business and the Forster family home at 2849 McKay Avenue after a snowfall (later renumbered 6208 McKay Avenue).